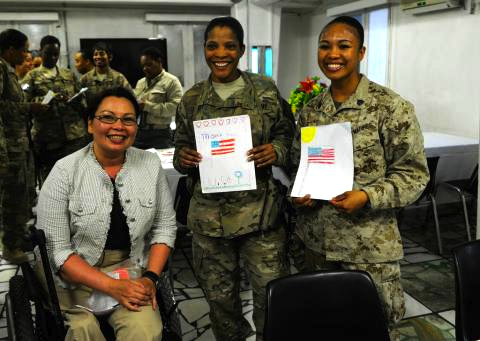 Rep. Tammy Duckworth distributes cards from second-graders at Stone School in Addison, Ill. and Highland Elementary School in Elgin, Ill. at a Mother’s Day dinner for U.S. service women at Camp Eggers in Kabul. WASHINGTON — Rep. Tammy Duckworth (D-Ill.) returned from a House Armed Services Committee trip to the United Arab Emirates and Afghanistan on May 15. In Afghanistan, Duckworth met with members of the American military and leaders in the Afghan government. “Our military men and women are the most dedicated and talented military personnel in the world,” she said. “Many of the troops I met with have gone through multiple deployments and all have sacrificed a great deal to further our mission in Afghanistan. All Americans should be proud of and grateful for their service. “In my meetings with the leaders of our military and the Afghan military and government, I stressed the need to continue our pursuit of Al-Qaeda, the Taliban and other terrorist groups who seek to attack America. On Mother’s Day, Duckworth met with a group of Afghan women and American women serving in the military. They discussed how to further empower women in Afghanistan and the crucial role that women play in America’s mission in Afghanistan. The delegation included five women from the House Armed Services Committee and one woman from the House Appropriations Committee. A veteran who lost both legs in the Iraq War, Duckworth has been actively addressing the needs of veterans and those currently serving in the military. 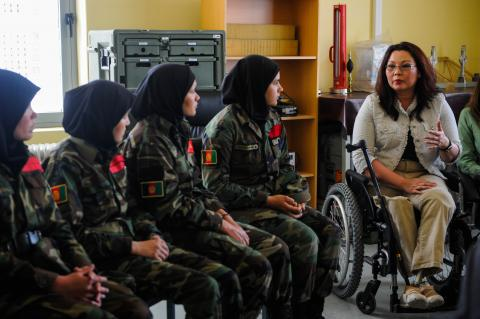 Rep. Tammy Duckworth speaks with female cadets at the National Military Afghan Academy (NMAA).